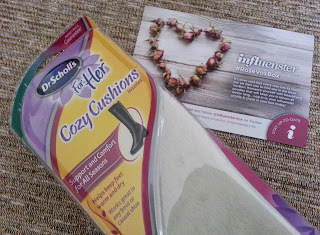 The third product I will be testing from the Influenster Rose VoxBox is, Dr Scholl's For Her Cozy Cushions. Dr. Scholl's For Her Cozy Cushions help keep feet warm and dry while providing all-day comfort. Their multi-layer design helps insulate the foot while two plush layers provide extra cushioning. Cozy Cushions help keep feet dry by absorbing perspiration and offer superior support on hard surfaces. I'm usually not a fan of Insoles but these felt so soft and warm, I decided to put them in my UGG's! They kept my feet warm and dry all day. I was actually surprised because not only were my feet cozy but it also provided support! I am very impressed by this product and I definitely recommend it!!! I know it says "for her" but my fiance loves them in his work boots, lol! He works outside in steel toe boots all day and said these kept his feet warm the entire time!! Dr. Scholl's should definitely make Cozy Cushions for MEN!!! I love these for my high heels ... I did't know they had them for boots too. I haven't tried the ones for High Heels, I'll have to add that to my list! These look great for MI winters!!! I love these. Time for the ouchie boot season so I need to get a new pair. I loved my Rose Vox Box! :) I sadly don't own any boots to use these.... I mean, we do live in FL! It's not boot season for long. I think they would look amazing in flip flops, lollol! These would be great for Maine winters too! Got it, use it and totally love it! Now with winter and wearing shoes for long hours, these will come in very handy. I bet those would be great to have in my shoes when I'm working or chasing the kiddos! Maybe the inserts would help with spinal alignment and back pain. I need that! I wouldn't doubt it, they are supportive and extremely comfortable! I am going to have to look into these. I need some kind of insol in my boots this winter.